UP ITI Instructor Recruitment 2018 Application are invited from 217 Govt ITI College to fill UP 3000 ITI Instructor Recruitment 2018. 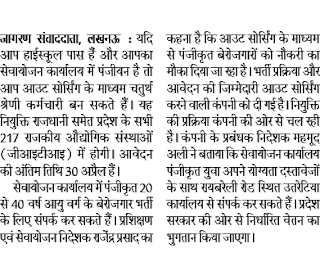 Latest news published from 30 March 2018 leading newspaper for UP ITI Anudeshak Vacancy 2018 through outsourcing in which tender passed by government officer and some agency take bid by giving reasonable amount. With in 2 or 3 days Agency published an advertisement related to UP ITI Govt jobs for 10th pass. 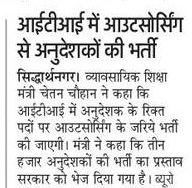 So those candidates who have registered themselves in Sewayojan Portal and have unique ID of Sewayojan they will get notification UP ITI Anudeshak Recruitment soon. 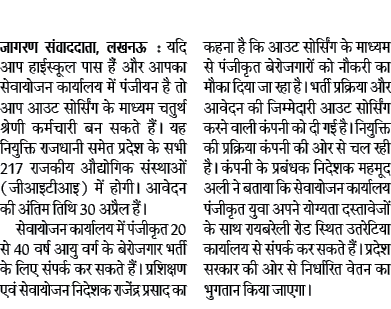 UP ITI Syllabus: Interview Question paper asked according to previous year paper we have also UPSSSC Instructor, Anudeshak with exam pattern approved by Uttar Pradesh Subordinate Services Selection Commission. Name of the Posts : Above 3000 posts because 217 Government ITI in district wise will be opened. Age Limit: Minimum age not be below 20 year and must not be above 40 years age as on Last Date. Age Relaxation as per govt rules 3 OBC, SC and ST 5 Years as per govt norms. Educational Qualification: Should have passed High school From any recognized board in UP. Application Fee : Fees is required. Opening date for Online Application: soon updated.